One of my favorite tools to share with students and teachers is Readability. This handy bookmarklet tool scrubs webpages clean of distractions by eliminating the ads and creating a more readable version of digital text. By itself, it’s a really useful tool for students, but when combined with Google Docs, it can be part of an effective and efficient method for taking digital notes. It’s important to note that the strategy offered here is not meant to replace traditional methods of note-taking. Rather, it is meant to be one of many note-taking strategies that can be introduced to students throughout the year as they engage in frequent everyday research experiences. If the goal of research is to find information, use it and properly cite sources, then introducing students to multiple strategies and allowing them to take flexible learning paths will help them become independent researchers and life long learners. 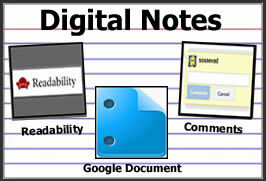 The slideshow below provides step-by-step directions for combining Readability with Google Docs to take Digital Notes.